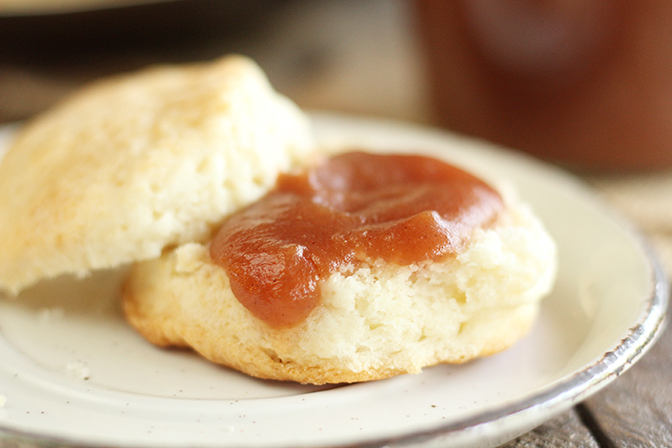 I just love apple butter. But to be honest, I’ve never made it. And even though we’ve not had a taste of that cooler fall weather yet, I’m craving some of those delicious flavors of the season – apple, cinnamon – you know what I mean. 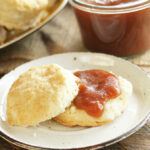 So I jumped over to JustaPinch.com and found this recipe for Homemade Apple Butter from home cook Gail Herbest. Now, I’ve always just been satisfied with the store-bought apple butter, but I had no idea just how delicious it could be. Nor did I know how easy. I mean, this recipe is made in the slow cooker for goodness sake! This stuff is amazing – perfectly sweet, but a touch tart. And I was worried that the spices wouldn’t be enough, but there were plenty to give it the perfect warm flavors I wanted. The most time consuming thing for this recipe is peel all the apples. But I pulled out my trusty apple peeler/corer (best $13 I ever spent) and it made quick work of the task. Since it also slices, I had 6 pounds of apples peeled, cored, and chopped in about 10 minutes. Gail’s recipe is perfection. That said, I did make a few little tweaks that are worth mentioning. Her original recipe called for 5 1/2 pound of apples, but since most markets sell apples in 3 pound bags, I used 6 pounds and it worked out perfectly. I also used an immersion blender to puree the mixture to a smoother consistency. But that’s it. It’s hard to fix perfection, right? This stuff is seriously amazing on hot biscuits, toast, over pound cake, just a spoon – you name it. And it makes about 6 cups so you’ll have plenty to share with family and friends. You can also water bath can this to save it even longer. Y’all enjoy! Peel, core, and finely chop the apples. Add the apples to the crock of a 6-quart slow cooker. Add the sugars, cinnamon, cloves, and salt. Mix well. Cover and cook on high for 1 hour, then reduce the heat to low and cook for 10 hours, stirring occasionally. Uncover and and stir well. It should be thick and dark brown. 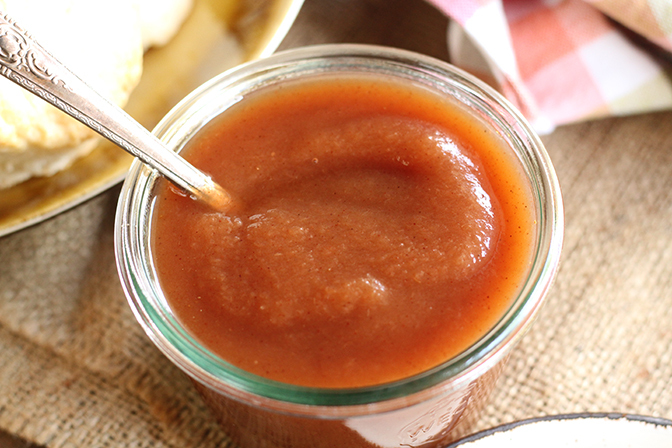 If you prefer a smoother apple butter, you can use an immersion blender to puree the mixture. Leave the lid off and cook for an additional hour on low to allow the mixture to thicken even more. 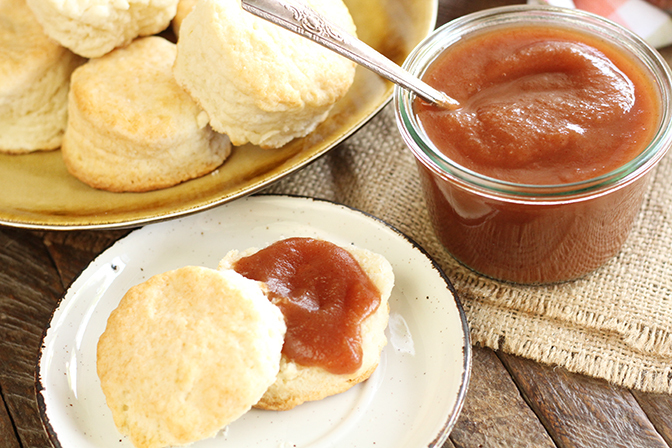 To store, allow the apple butter to cool, then place in sealable containers or jars and refrigerate for a few weeks or freeze for even longer. SO delicious. Thank you for sharing. I lived in Va. years ago and I watched a friends mother make it outside in a huge black cast iron pot. Apples were cheap in those days. IT took awhile but fun to watch. Nothing taste better than homemade. How long would you need to water bath the applesauce? Thanks again for the recipe. Sorry, I meant Apple Butter. About 10 minutes for half pint or pint jars. Can you substitute 100% apple juice concentrate for the sugars? That’s not something I’ve tried, so I can’t tell you how it would turn out. Hi there – I just discovered your website and am trying the Orange Cake soon! 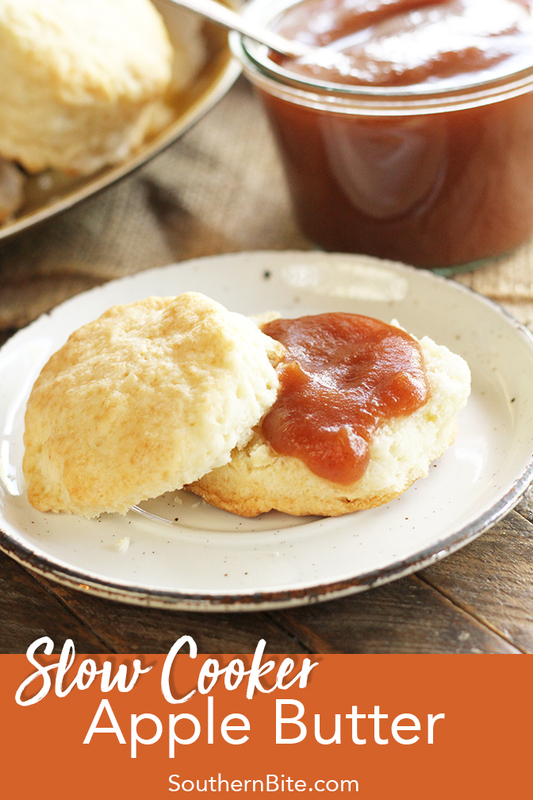 I don’t know if you have an Instant Pot (electric pressure cooker), but apple butter can be made in about an hour. I’ve made numerous batches and give them away faster than I’m able to pull them out of the water bath. It was a recipe from a co-worker than she used for years using her slow cooker and then converted it to an IP recipe. 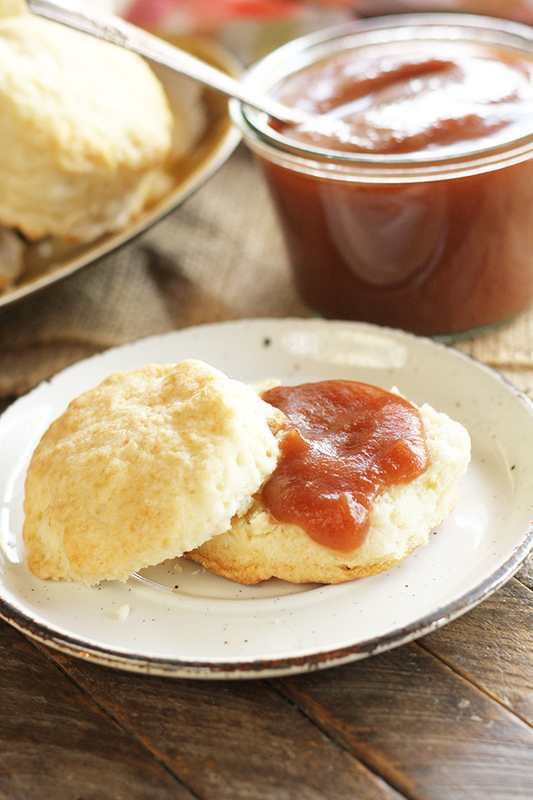 I’ve been told over and over that “This is the best apple butter I’ve ever had.” Seriously good stuff! I do have an Instant Pot but haven’t tried doing apple butter in it. Thanks for the idea!